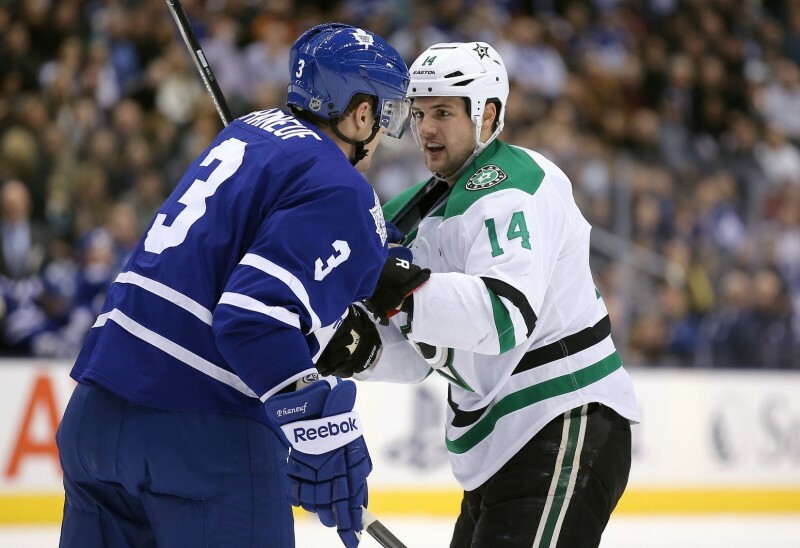 Dallas Stars captain Jamie Benn will not face supplemental discipline for his borderline hit on Minnesota Wild forward Matt Cooke Saturday night in Dallas’ 3-2 overtime loss to Minnesota. No penalty was called on the play, much to the dismay of Cooke, and Wild fans. For those who missed the hit, here is the video of it, courtesy of Fox Sports North. This hit could have fallen under the provisions of Rule 48: Illegal Check to the Head. A hit resulting in contact with an opponent’s head where the head was the main point of contact and such contact to the head was avoidable is not permitted. In the play above, Cooke crouches and lines up to hit Benn as Benn carries the puck to the zone. Benn sees him coming the entire way, loses the puck, and takes out Cooke. Because Cooke has crouched, Benn contacts him high. Had Cooke not crouched like he did, Benn might have dealt a proper full-body check. Benn also has a size advantage over Cooke, as Benn is 6’2″ compared to Cooke (5’11”). This contributed to the play’s end result. This play by Benn also appears to qualify as “Defensive Contact to the Head” in the eyes of the Department of Public Safety. In the video below, Brendan Shanahan highlights three examples of hits similar to Benn’s on Cooke that resulted in penalties called on the ice, but not in supplemental discipline. This is not a situation Stars fans want to see their team’s captain involved in. Benn got away with it this time, but if he continues to make plays like this, the NHL will keep a closer eye on him. With the Stars’ situation in the standings growing progressively dire as the losses pile on, the team needs Benn to be on the ice instead of in the press box due to a suspension. Check out our partners at TiqIQ for the best deals on Dallas Stars tickets for all 2013-14 games.